Sleep is important. We all know it and yet we don't always practice what we preach. Getting eight hours of the good stuff can be the difference between a good and bad day so it's important to set yourself up in the right way. A relaxing bedroom is the first step toward a more peaceful slumber and one of the most overlooked features are the window treatments. Whether it's made with sheer fabric or a more luxurious linen or velvet, drapery is one of the best ways to pull a master bedroom together. Scroll on for seven bedroom curtain ideas that will help you find the land of nod. 1. 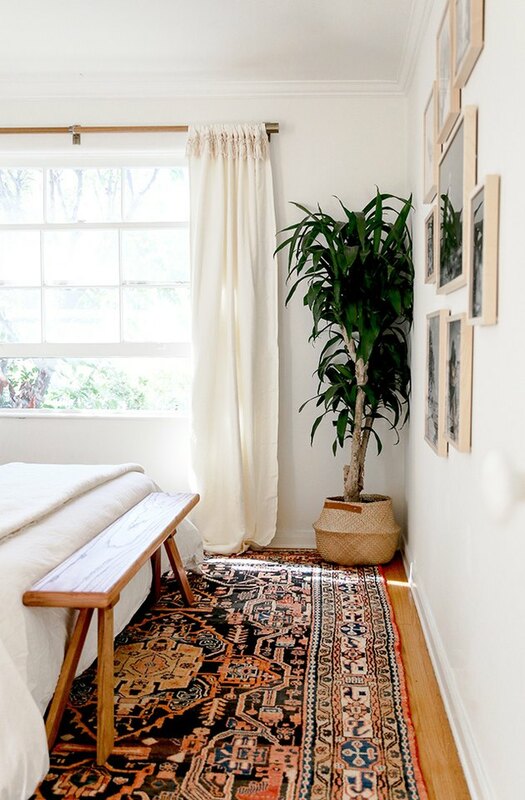 Invest in a good curtain rod, we're serious. There's nothing worse than a beautiful set of drapery panels hung from a basic curtain rod. Don't do it, seriously. Take notes from Robert and Christina over at New Darlings who hung custom, thick linen curtains on a brass midcentury-style curtain rod. Inspired by French interior designers, the design-loving duo adorned the combination of lush velvets and brass accents with natural textures, and we think they've nailed this blush master bedroom scheme. 2. Make a statement in a neutral room. A pair of statement curtains can go a long way in a neutral room, creating a focal point and drawing attention to a spectacular view. 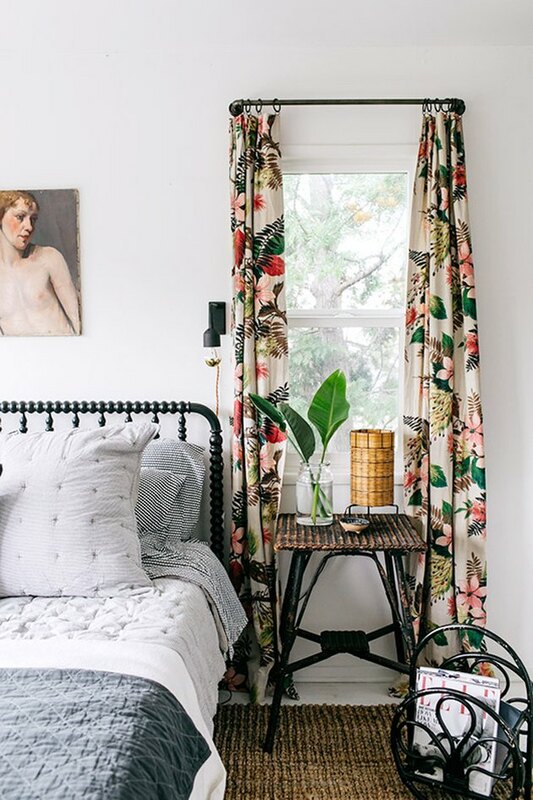 Victoria from SF Girl by Bay created her own statement bedroom curtains by repurposing some vintage barkcloth drapery panels that she found on Etsy, adding metal curtain eyelet rings. Victoria finished the old-school Hollywood vibe by hanging the drapery on an adjustable iron rod. 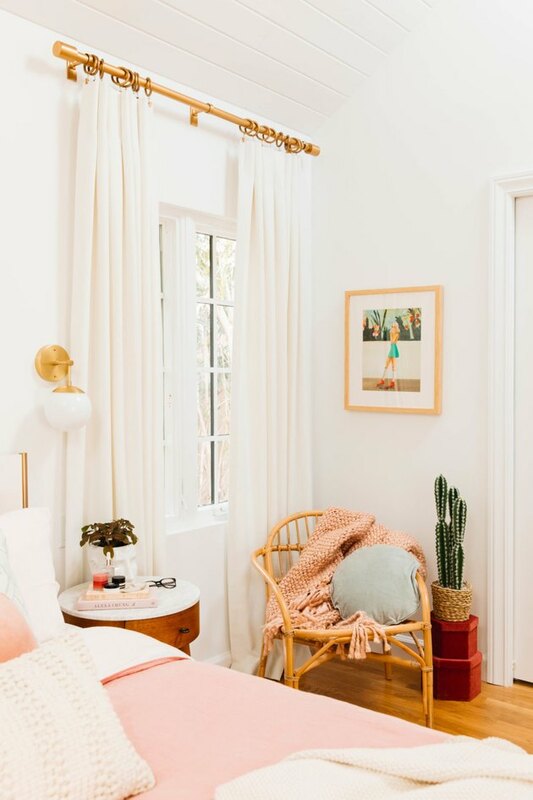 Look up master bedroom curtain ideas on Pinterest and you'll find an influx of options from cult favorite Urban Outfitters. Boy, oh boy do these guys know a thing or two about dreamy window coverings. 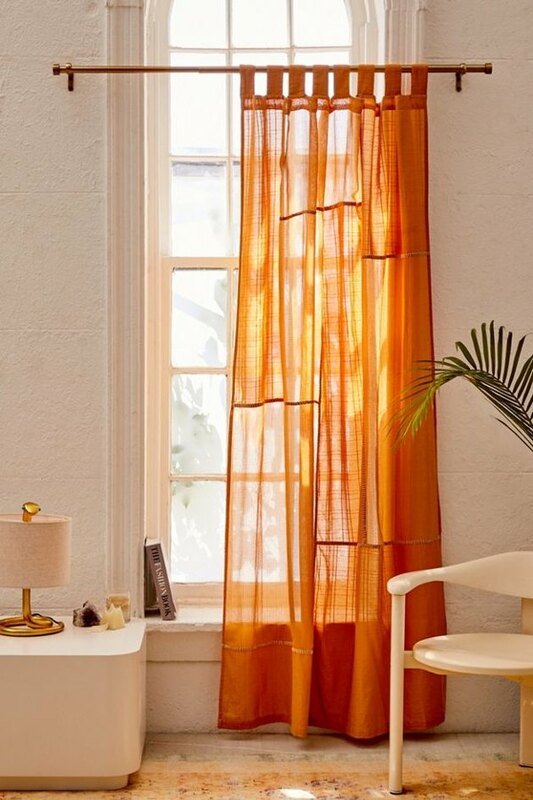 The patchwork sheer known as "Chloe" provides an unexpected pop of orange in this light and airy room, championing a breezy boho look while also allowing natural light in. While these probably aren't the perfect option for bedrooms that receive morning light, they sure do look pretty. 4. Add interest with curtain tiebacks. Plain white curtains blend into the background but can be jazzed up with the simple addition of statement tiebacks. Kelly from Studio DIY finished off her light and bright master bedroom with drapery panels featuring pompom fringe, pompom tassel tiebacks, and a brushed brass curtain rod. 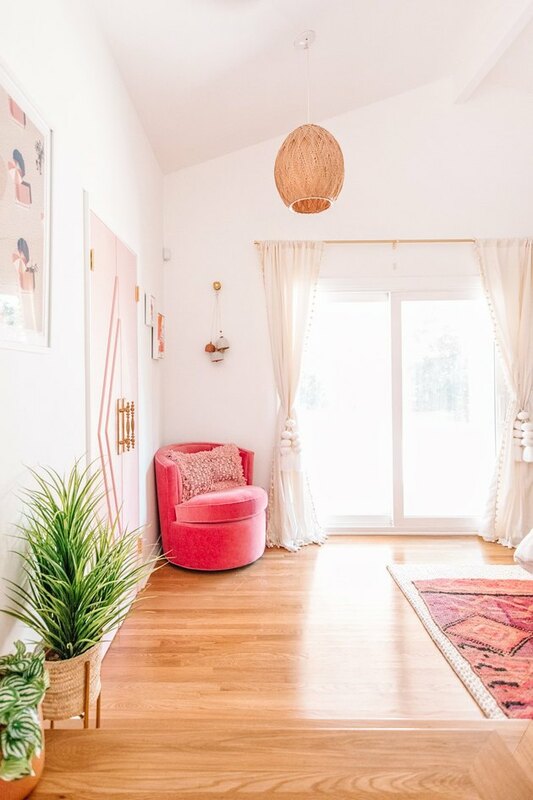 The perfect background for a vibrant pink velvet barrel chair and woven area rug. 5. Don't tighten the purse strings. If you're going to go luxe with your bedroom curtain idea, don't do it half-heartedly. There are plenty of cheap velvet options floating about online that just won't cut the mustard when it comes to creating a sumptuous environment. 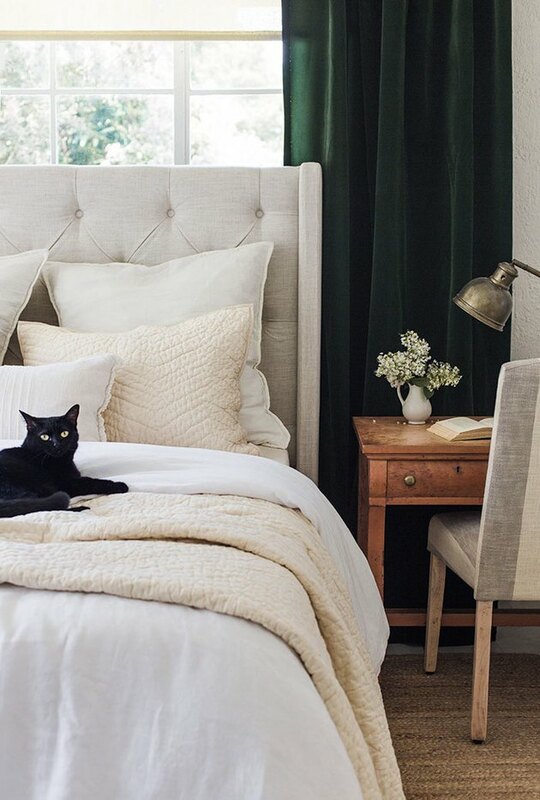 Blogger Jenna Sue learned the hard way before sourcing these matte green velvet panels, which took her master bedroom to the next level. 6. Opt for subtle design details. Blackout drapery doesn't have to be boring as Sarah Sherman Samuel proves with her design for Max and Margaux Wanger's master bedroom-come-nursery. This woven cotton, blackout bedroom curtain will keep light at bay but also looks stunning with fringe tassel lining the top of the rod pocket. Anything to help us sleep in, right? 7. Be clever with the curtain lining. Granted, this is indeed a child's bedroom, but Emily Henderson can do no wrong and we'd happily steal this bedroom curtain idea for our own sleeping quarters. She opted for both sheer and lined linen to block out direct sunlight during the day while still allowing natural light to come through. She finished the look with some French hardware, and hung the panels from the ceiling to make the room look bigger. Emily, we salute you. Still craving window treatments? Check out our feature on living room curtain ideas, too!